Tone It Up! Why? What? Who? and How? I really appreciate all the feedback and responses to my Tone It Up 7 Day Slim Down posts. I’ve been getting a lot of questions about Tone It Up from those who haven’t heard about it yet. I wanted to share the reasons Why I joined the Tone It Up team and why I love it so much. So this is for all you Ladies out there (especially you Moms) who have been struggling to get in shape and healthy – just like me. After having Seppe, I was definitely not happy with the effects that pregnancy had on my body. I didn’t even have much time after having Gio to get in shape before getting pregnant with Seppe. They are 16 months apart. I pretty much spent two years, 2004-2006, being pregnant :-( And it took its toll on me physically, mentally, and emotionally. Seppe is now 4.5 years old. I’ve spent those years trying to find quick solutions to losing weight, magic pills that promised to flatten my tummy, roller coasting with working out and not, getting depressed because I didn’t. Nothing I tried worked for me. I considered plastic surgery but I didn’t to spend that much money and it scared me. When I found Tone It Up online, I was immediately impressed. Tone It Up is NOT a diet. It is a Lifestyle. There is no quick solution. You have to put in the work and make changes. I swore that I would never give up white rice and that I could just eat whatever I wanted in smaller portions. I learned that I had to Change the way I thought about Health and Fitness. The Tone It Up Lifestyle requires you to make the decision to put your Health First. If you are closed-minded to trying something new and learning what is healthy and what isn’t, Tone It Up is not for you. It doesn’t mean that you can Never eat your favorite not so healthy food. The Tone It Up Lifestyle, allows for slip ups and cheats :-) The healthy recipes they have actually taste amazing. Plus through them, I found Jane of Eye It Try It and Grace of MomInModeration who have even more great healthy recipes. The workouts are challenging but not so hard that I can not even think about working out again. They have so many to choose from and come up with new ones that keep workouts interesting. I was not pressured to get their DVD or their Nutrition Plan. What is Tone It Up Nutrition Plan and the Slim Down? I wanted to get the Nutrition Plan but couldn’t afford it right away, so I saved up until I could. It is definitely worth the investment, and isn’t all that expensive compared to all those other diet gimmicks out there. A one time payment of $149.99 gets you a Lifetime membership to all the updates, recipes, and tips. Their Nutrition Plan – what some may call a diet – is a guide that has specifics on When to eat What kinds of foods. It has healthy recipes, and workouts. There are different plans to match specific diet needs: Vegan, Gluten Free, and a new Pescatarian plan. Who is Tone It Up? It’s simple!!! Just go to their website: toneitup.com :-) You can sign up for their free weekly newsletter to get the latest tips, recipes, and workouts. Join the community – it’s free! http://toneitup.com/community/ You don’t have to get the plan to be a part of the community. Everyone can be a part of it. There are groups you can join to find others with similar interests and goals. It’s a great place for support, motivation, and inspiration. I hope this helps those of you who are curious about Tone It Up. I used having kids and my kids in general as excuses to not workout. I would always say “I’ll start tomorrow.” Stop making excuses and Do It! You owe it to yourself. TIU 7 Day Slim Down: The Results!!! Waist: 26 1/2 inches. That is an inch and a half smaller :-) woo hoo!! Bust: 32 inches – that stayed the same and I don’t mind. Hips: 34 inches- I think that’s an inch smaller. I am very very happy with the results :-) I wasn’t expecting to get a flat tummy and be where I wanted to be in just 7 days, but this is a great start! And it is such a Big motivator for me to stay on track. I am definitely going to continue following the Nutrition Plan so I can reach my goals. I would like to tone up at least 6 more inches in my waist. I know it will not happen over night and I am willing to put in the work to get the results I want. This is definite proof to me that the Nutrition Plan works. I know a lot of you are curious about it. You can get all the info from on Tone It Up’s Nutrition Plan website: http://www.toneitupdiet.com/ It really isn’t a diet though. Seriously! The only part that can be called a diet is the Slim Down and that really isn’t one either. It’s just a strict version of the Nutrition Plan :-) Tone It Up! is a Lifestyle. It is different from the Lifestyle that I was living and considered Healthy. One of my favorite quotes “Change is Uncomfortable.” Such a true statement. It’s not easy changing and breaking my bad habits, but it’s worth it. I feel so much better after the Slim Down. I’m stronger, less bloated, and have more energy. I am enjoying learning new recipes and new ways to push myself in workouts. Today was pretty much the same as yesterday – food and workout wise. I started with my 30 min bootycall walk. I am making it a goal to at least do that every morning from now on. It just helps wake me up and gives me a boost in the morning to deal with the kids. There wasn’t a workout listed besides a second cardio session so I took Gio out for a run while he rode his bike. 3 miles. Grapefruit for Meal 1 and a slim down smoothie for Meal 2. I did get some Brown Rice Protein, but like I said in my video, I didn’t like it. Lunch was a Lean Green Salad and Dinner was Chicken and Asparagus. I plan on continuing with the Nutritional Plan. I will post updates on my progress, and hopefully some recipes and tips for living a Healthy and Fit Lifestyle. Tone It Up is truly the best program for me. I am so grateful to Karena and Katrina for all their hard work. Being part of the Tone It Up team and online community is inspiring. It’s nice to have others who have similar goals and who give you support. Today wasn’t so bad. I was still craving bread and sweets, but I wasn’t all that hungry. I have a sweet tooth, and usually I will eat fruit to help curb the craving. The slim down limits how much fruit you eat so I’m missing them. I am sick of the Slim Down Scramble. I’ve just had it too often. I am dying to try out all the pancakes and smoothies in the Nutrition Plan. In my video, I said that I was going to do the TIU workout video for the booty, lower abs, and love handles that I did yesterday, But since there wasn’t any workout on the Slim Down (besides Cardio) – and I was really tired, I decided to take it easy and get to bed early. (Unfortunately, this didn’t happen because I had to stay up to fix all the videos I uploaded for the last 3 days) I went for a 3 mi run for my second cardio. Food was pretty much the same as yesterday. I made it through lunch this time. I used the TJ’s Chicken Burger this time and it was better than the tofu I used yesterday. I really like M4 with the berries. I love fruit :-) I also started drinking green tea. I’m not a green tea person, but I didn’t mind it. I got a decaf tea because caffeine gives me headaches. All in all a good day :-) I am looking forward to Day 7! Day 5: Well it was another tough day today. No headaches, so I’m pretty sure that yesterday’s was due to being up so early. The toughest part about this Slim Down is the discipline to eat pretty much the same thing the whole time. When I do it again, I will plan my meals out ahead of time so I can get some variety. I am the type of person that can’t eat the same thing over and over. I am frustrated that I can’t have the things I want. Yes, it would be easy to just quit, but I don’t want to. I want to do the whole 7 days so I am staying focused. But I’m not happy about it. lol. Today’s food was pretty much the same as yesterdays – probably why I wasn’t too thrilled. Slim Down Scramble with no sea salt wasn’t as good for me. I have come to love grapefruit though. I look forward to it :-) Lunch didn’t go too well. I had Tofu with spinach, green beans, and cucumbers. I am definitely over the lunch time salads. I couldn’t eat it all. I added some extra greens to my dinner – Chicken seasoned with Balsamic Vinegar (No Salt). I was up at 6a for my bootycall – much better than 4a :-) Did a fast pace 40 min walk. Then, I walked my son to school, walked home and walked to pick him. Did I mention that there is big hill that we have to walk up and down both ways to get to his school?? I am really proud of my boy for walking to and from school today. He was pretty tired on the way home – and so was I. For snack time, I made him a mini fruit salad. It looked so good: strawberries, blueberries, blackberries, and grapes. I wasn’t sure if it was ok for me to have some, so I stuck to having an apple. I did 3 sets with 10 reps of each exercise. My booty is definitely feeling it. I want to do it again tomorrow when I do my usual booty workout. I love the pyramids. You work up to a high intensity – almost maxing out – then you come back and down. My whole body is sore :-) Only two more days to go. Hanging in there. Day 4 was tough. In order to get my AM cardio in, I had to get up at 4a so I can get to the gym and back before my hubby went to work. If I hadn’t put the alarm on the other side of the room, I wouldn’t have gotten up. Needless to say, I had very little energy when I got to the gym. I did the Weight Loss Program on the Elliptical for 30 min. Worked up a good sweat and felt awake by the end of it… but still tired. I got back and the hubby left for work. Since today was also Gio’s first day of school as a first grader, I decided that I shouldn’t look like a hot, sweaty mess when I dropped him off. So I showered and got ready, put makeup on and everything. I walked with both the boys to drop Gio off and walked back home with Seppe. I was very hungry when I got home and was very happy to make the Slim Down Scramble. I wound up getting a head ache after breakfast. I think it’s a combination of lack of sleep and low blood sugar. This is the longest I’ve gone with so few carbs. I was happy when it was time for Meal 2 (Grapefruit of Stevia). I felt a lot better after having that snack. I also took a power nap and when I woke up my head ache was gone. It didn’t come back for the rest of the day. But I made sure that I kept myself hydrated and kept to my meal schedule. Lunch was the same as yesterday except I used strawberries instead of Mangos. There is just something about summer time that makes me want to add fruit to all my salads. Snack was a Slim Down Smoothie. Very yummy but I love the Protein Shake for the slim down so much more. Dinner was Salmon and Broccoli. For cardio I did my 3 mile run. It was at a slower pace because my legs were tired from the workouts above. I didn’t realize how tired they were until I got back from my run when they felt so weak. My abs are pretty sore too. Day 3 was a day for improvising. My husband’s schedule for work on Sundays leaves me with the boys pretty much all day. I did get in my 30 min bootycall – my usual 3 mile run. What I was brainstorming on was how to fit in a my second cardio session and a workout with the boys. I would have loved to go for a run with them while they rode their bikes, but my youngest doesn’t go very fast right now. He is still getting use to riding his bigger bike. My first thought was to turn on the OnDemand and do a few of the workouts. There’s always something for cardio and total body workouts, and there’s so many to choose from. I figured I had my problem solved, but when I went to turn the tv on, it was blank. My cable box acts up a lot and of course it had to act up when I needed to use it for something besides wasting brain cells. So I pulled out the Your Shape and EA Active 2 for the Kinect. I use to work out with these two a lot, but for some reason just got bored. For my cardio, I did the Your Shape for 40 min. There was a cardio routine and a cardio boxing routine that I did. For a total body workout, I put in EA Active 2. This can be really challenging if you use weights and do the moves correctly. I spent an hour doing the Total Body workout. Gio joined in and did a pretty good job of keeping up. I know I wore him out which worked out because he has school in the morning. M3: Salad: Spinach, Cucumbers, carrots, and Trader Joe’s Chili Lime Chicken Burger Patty. The Chicken Patty was all natural :-) And tasted pretty good. The lean meat on top. Ingredients for the Chicken Burger: All Natural and no salt. M4: Veggies with Hummus. Not my favorite meal, but it wasn’t too bad. I ate mostly carrots and celery. I had a few pieces of broccoli too but I just don’t like broccoli raw. I need it at least steamed. 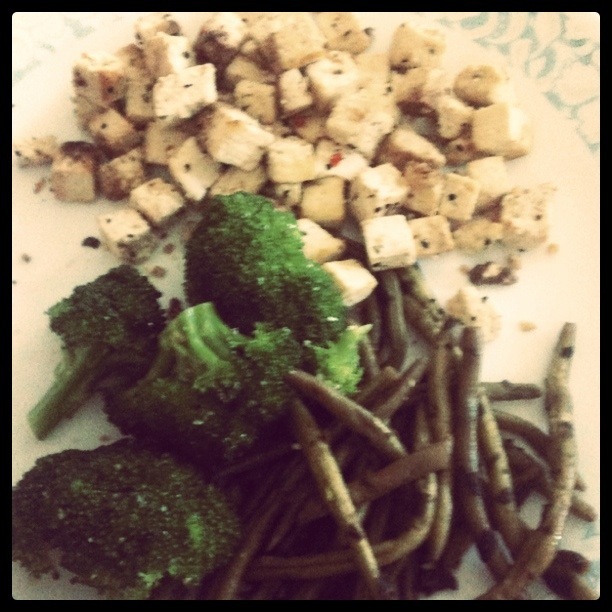 M5: Tofu with broccoli and green beans. Not my favorite way to have tofu but I ate it.